When you create a Gmail account, you actually get two email addresses – one is the regular @gmail.com while the second email address has @googlemail.com in the domain. After opening its formerly invitation-only Gmail webmail service to anyone with a mobile phone in August 2005, Google removed that requirement Wednesday. Now, anyone can signup for a Gmail account by creating a Google Account. The mobile phone requirement was designed to prevent Gmail accounts from being created by robots and stop spammers from signing up multiple times. As of Wednesday afternoon, the Gmail signup URL still redirected users to the SMS-based method, but a support article on Google’s site says the world is now welcome without an invitation or phone. If you’re one of the folks that saw the story about Google having some trouble with a few Gmail accounts, and wondered what you could do to protect yourself from such an unfortunate eventuality, you’re in luck. It’s a simple tip, and one that can be implemented in a number of ways, but the gist of it is that you’re going to want to download all of your email out of your Gmail account using the POP download functionality in your account. Now, if you’re wanting to use an email client that you already happen to use for other mail (for example, your work email), you may not want all of that Gmail spilling right into your inbox. So to prevent that, make sure that your email client supports message rules based on the incoming mail account. In Outlook 2007 (I remember seeing it in 2003 as well) there’s a rule called “through the specified account” that allows you to choose which incoming account it should act on. That way you can move all mail coming through a specific account to a folder, which can then be moved to a different PST file for archiving. Once you’ve determined how you’re going to keep from mixing up all of your email, go ahead with setting up the connection. To back up ALL of your Gmail, simply navigate to the Forwarding and POP section of your Settings in Gmail, and in the POP Download section click the radio button beside “Enable POP for all mail (even mail that’s already been downloaded)”. Then configure the email client exactly as described on the Configuring instructions link at the bottom of the POP Download section. There are instructions for virtually every major email client out there, and even if your client isn’t listed, it should be fairly simple to see how to configure yours from looking at instructions for a similar client. And that’s it – now all there is to do is wait, and wait, and wait. If you’re like me and your Gmail box is already well over half full, it can take quite a while to download close to 2 Gigs of mail. But think of the peace of mind you’ll have knowing that your mail is safely in your hands. 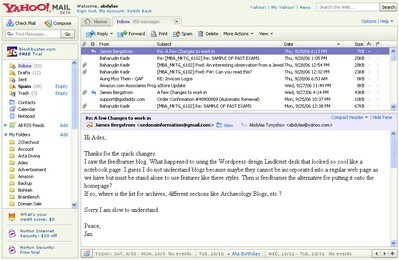 New Yahoo!Mail which is in it’s beta version is much like Outlook Express. It is divided into three sections: Folders, Email Headers, and Preview Pane. Once you click on the email title it will automatically load the email into the preview pane. Everything is very easy and fast now; compose, reply, and attachements are done on the fly, as opposed to reloading the whole page previously. ~A note of caution, the Mail Beta still incomplete. You will find some missing features and some additional issues with fetching some emails. I’ve had to completely reload the browser page sometimes in order to resold the issue. AND THERE IS NO EASY WAY TO CONTACT SUPPORT ON ANY ISSUES YOU MAY COME ACROSS. If you want to try it out for yourself, you can sign up for it here. Google’s darling Gmail has just launched a new feature they’re slowly rolling out to users: POP checking of other accounts. If you’re one of the lucky few, under the Accounts tab in Gmail’s settings, you can now add up to 5 other accounts (if they have POP3 access enabled) for Gmail to pull email from. Of course, you’ve always been able to forward email from most other accounts to Gmail, but the significance here is that by enabling Gmail to check your other accounts, it can grab virtually all the mail you’ve ever received in those accounts (if you haven’t taken it all off the server with a desktop client, that is – not just the messages *after* you turned on forwarding. While this is certainly a great new feature, I must again echo the requests of many by asking: why on earth Google hasn’t joined the rest of us in the 21st century by adding IMAP access? Considering the plethora of devices consumers are using (desktops, public terminals, phones and PDAs) and the multiple ways they have already offered for accessing Gmail (web, WAP, mobile client, etc.). Is IMAP that much more difficult or expensive to implement? I realize their intention is to keep you doing email the Gmail way – labels, web ads and all – but I still say its time to grant usable access to those who need the power of desktop software and tools for their emailing needs. Gmail’s popularity may be viral, but the e-mail software is not a virus–despite a Microsoft alert. False positives happen occasionally with security software. For example, McAfee’s security tools earlier this year flagged Microsoft’s Excel, and other legitimate applications on users’ PCs, as viruses. Also, Symantec this summer identified a Church of England software program as spyware. Windows Live OneCare is Microsoft’s first consumer antivirus product, released late May. The Gmail issue isn’t the first problem it has had. During testing, OneCare was found to disable Absolute Software’s Computrace LoJack, an application that functions like a homing device to help recover a laptop after it has been lost or stolen.